The Aski adjustment plates let you move otherwise-fixed Dynafit-style ski bindings. This lets you use multiple boots or can help work around existing drill holes in your ski. The adjustment plates rely on bolt-tension to hold the toes or heels in place. Specialized bolts screw into jam nuts under the plates. Radical Toe plate works with any four-hole binding with a 30mm width. See patterns. LTR / Superlite 1.0 heels are for Dynafit Low Tech Race 1.0 and Superlite 1.0 bindings. All plates are sold in pairs and come with jam nuts, but are currently shipping without bolts. Toe mounting pattern is 40 x 91 (mm WxL), heel is 26 x 54; same as Dynafit, see plates. Will the Kreuzspitze bolts for the LTR Superlite heel work with the Aski adjustment plate for the Superlite 1 heel? I bought an Aski adjustment plate for Superlite 1 heels that came without any hardware and am having a hard time finding bolts for it. Do you even sell the LTR hardware separately? I see the other thing I could do is to buy the new Kreuzspitze LTR/superlite plate. Hi John, yes unfortunately you have to shave the heads on some bolts with those plates as we've been unable to source the stock hardware. It's not ideal to use the Kreuzspitze M5 nuts on the Aski plates as the nut slots follow the Dynafit design and are M6. That said, it would probably be fine under tension. Can you clarify the bolts for me. Am I right the nuts are M6? And the countersunk bolts have to be ground down to a head of 8mm to fit the binding? If so, doesn't that leave only a 1mm overlap between bolt and binding? Seems thin to me! Do the unavailable dynafit plates use M6 as well? Hi James, yes, these are replicas of the Dynafit plates which use M6 bolts. The shrunken head is not a problem as a standard bolt (or customer Dynafit bolts) is thick there. If you want to use M5 bolts, check out the new Kreuzspitze plates for the LTR/Superlite 1.0. 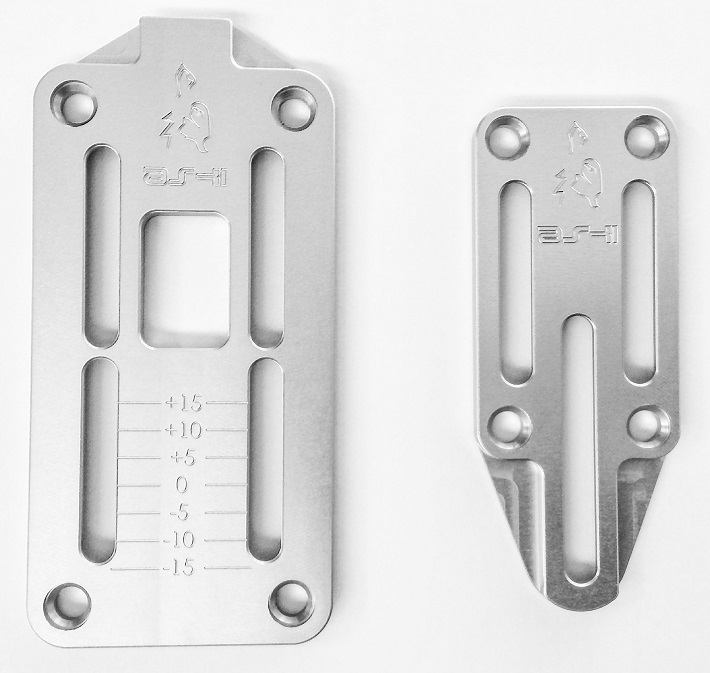 Will you be getting anymore of the adjustment plates for the LTR heel pieces? Hi Paul, we likely won't be getting any more of that specific plate, but we expect to have another adjustment solution for the LTR & Superlite 1.0 in about two weeks. Stay tuned! Hi, can you tell me what the weight of the heel plates is please? Hi Jonathan, the Radical toe plate weighs 38g and the LTR/Superlite 1.0 heel plate weighs 20g. Hi Ski Mo, much appreciated the service and products you provide...I have a pair of used DPS Wailer 106's that have been drilled 1x for a set of Kingpins. I'd like to re-mount these skis with a pair of Dynafit Rotation 10's. 1) Would you know if the mounting pattern of the Dynafit Rotation differs enough from the Marker Kingpin so that I can drill new holes and mount on the center line? From what I can discern from Wild Snow's mounting patterns, it looks like the heel piece mounting patterns are too close. 2) If the patterns for the KP's and Dynafit Rotations are too similiar, forcing me to move up/down 1CM, would these Ski plates allow me to work around the drill holes and mount the Dynafit's center-line? Hi Doug, the toe is the important part to set your position on the ski (the heels have enough adjustment range to work around holes). Unfortunately there isn't enough room to squeeze a Rotation toe around a Kingpin and be within DPS guidelines for remounts. I'm sure that won't stop some folks though! Unfortunately these toe plates only work with the Radical 1.0 pattern so they are no help. what is the weight and height of the toe plate? Hey Brendan! I've got the answers to both questions listed below! Each toe plate is weighing in at 38g per side excluding hardware and the height is an extra 4.75ish millimeters off the top sheet! The plates are well made -- but the lack of including appropriate bolts makes installation a royal pain. The heads on standard M6 flat head machine screws is too big to fit in Speed Superlight 1.0 heel piece. I couldn't find any suitable bolts from a supplier -- so to make standard M6 bolts work I'll need to grind down the sides of the heads. I have a bunch of suitable M5 bolts from a Binding Freedom kit -- but M5 jam nuts are too small for the channels in the plates. It's real pain that ASKI doesn't include suitable nuts and BOLTS in the kit -- or at least offer the a set of suitable bolts. Hi Randy, in defense of ASKI...they custom made these for us! It's not a kit they are offering, but rather we wanted to have something available to help folks with older bindings. Unfortunately Dynafit uses virtually unsourceable screws so modifications are necessary. The toe plates also work fine with other binding models that accept wider heads. It would be helpful to at least know which M6 bolts are needed. I ordered some M6x12mm bolts from Amazon -- but those are too short. Hardware stores often have slim pickings in metric fasteners. What length M6 bolt is needed ? Hi Randy, the 12mm bolts should suffice. Once you grind the heads down enough to seat in the holes there will be enough length. In fact you may even need to shorten them a hair. Hi Joao, these plates are currently shipping with nuts but not bolts (you may need to modify some M6 hardware store bolts). Yes they work with the LTR 1.0 binding. You'll get 30mm of adjustment. What did the toe plates weigh? Hey Ted, they're 38g per side, excluding hardware. Can these be used with the Trab Gara toepiece? Hi Ted, absolutely! You'd actually get about 12mm of extra adjustment range out of the plate because the hole pattern on the Trab toe piece is much shorter than a Radical toe. Hi Tim, just updated the description. They mounting pattern is the same as the Dynafit plates, which are 26mm x 54mm (width x length). They do add a little less than 5mm of stack height.